“Feel Fit” is specially designed, effective health booster treatment with all in all natural ingredients available within you! The objective of our anti-ageing treatments is to analyse the causative factor; whether genetic, biological or environmental that is influencing on the overall ageing process of the person. We also assess various risk factors with the patients to determine potentially extrinsic and intrinsic causes, contributing to pre-mature ageing of the person. Our primary goal is to improve overall health, extending active life style and improve the stamina and immunological makeup in preventing different age related diseases. We have designed a unique treatment protocol that employees patient’s own PRP, which is actually a component of blood, rich in its platelet content. These platelets can secrete growth factors and cytokines enabling faster healing and regeneration of damaged cells. As per our protocol, we inject fat stem cells activated with patient’s own PRP to promote faster proliferation of resident cells, improve physical power, energy level and stamina and normalization of internal organ functioning.Our top priority is thus to provide very comprehensive, individualized treatment pattern which is best suited for the patients undergoing treatment, aiming their maximum results. At Advancells, in choosing the treatment strategy, we give special consideration to the stages of damage and accordingly the purpose of the treatment will be designed. An algorithm for assessment and treatment is made accordingly. As a part of our treatment, patient’s peripheral blood is withdrawn to prepare autologous plasma concentrate, highly rich in platelets possessing various growth factors. The stem cells from one of the richest autologous sources of your own body such as Adipose Tissue. will be extracted and stimulated with PRP; this mixture will be infused through intra venous administraton to promote overall health, stamina and vitality. As per these results, the patient will be counseled further for final decision of protocol. 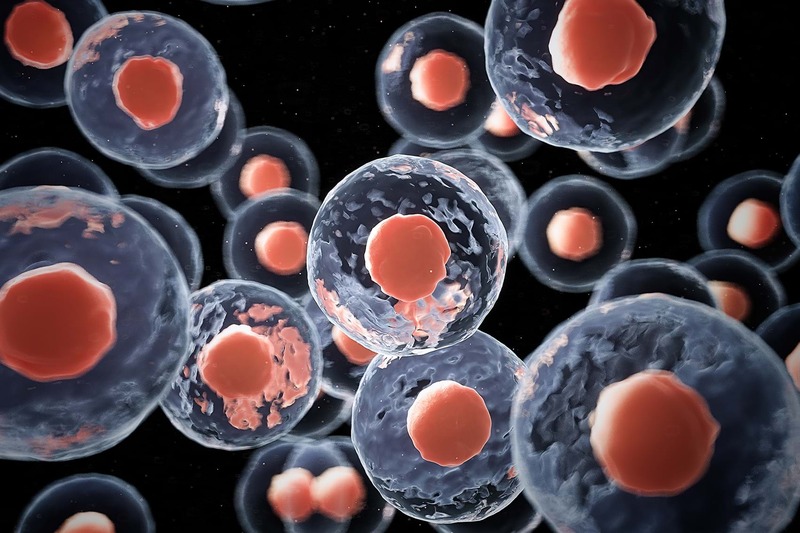 SVF cells or stromal vascular fraction stem cells are the most entrusted cells, sleeping for years inside the stroma of adiopse tissue; more precisely known as fat. The data accumulated from worldwide clinical trials, and bench-side research have endorsed that these stem cells are supported with various structural and functional proteins; which are responsible for skin regeneration and rejuvenation at the cellular level. It is proven that when these stem cells are super charged with autologous platelet rich plasma, they improve blood supply of the skin, ensuring better oxygenenation to cells. Around 100 CC fat is extracted, preferably from the sub-cutaneous layer of the pre-umbilical area. 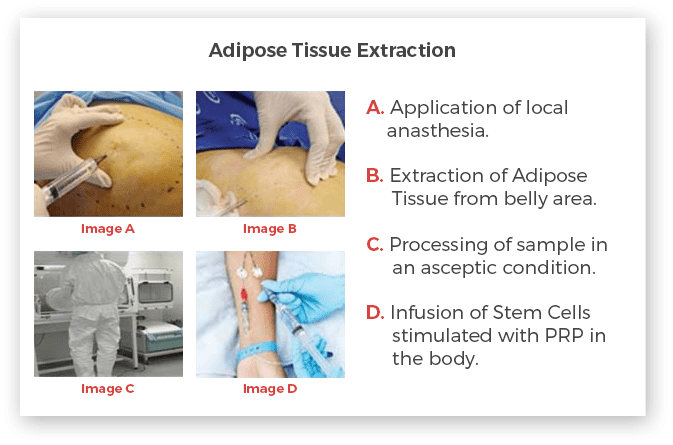 The Adipose tissue will be collected with the application of local anesthesia; however general anaesthesia can as well be opted in case required. PRP is rich platelet concentrate, with the seven essential protein growth factors which can rapidly initiate cascade of reactions; additionally it includes three very fundamental proteins that can act as a “Cell Adhesion Molecules” to activate signal transmission. This activation can express the gene, directing the cellular proliferation, matrix formation, osteoid formation and collagen synthesis; which promote tissue repair and regeneration. Research has as well confirmed that after injection in the body, PRP can actively secrete growth factors within 10 mins while more than 95% of them are secreted within 1 hr after activation. Around 30 CC venous blood will be withdrawn from one of the two arms and maintained under controlled condition till processing.In order to prevent unnecessary activation of platelet, the venous blood of the patient will be collected using suitable anticoagulent. 100 CC of fat sample along with 30 CC of venous blood, will be transferred to the processing lab; under controlled condition. Both the samples will be processed in the state of the art class 10,000 clean room in compliance with ISO and GMP standards. The isolated stem cells will be characterized for quality, viability and purity. Before infusion, these stem cells will be super stimulated with autologous PRP to maximize the benefits of the treatment. 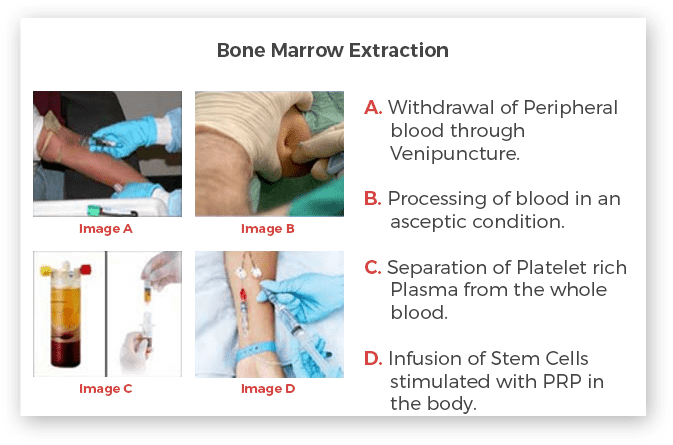 Once the PRP is ready to be injected back into the body, stem cells will be enriched with autologous PRP prior to infusion; we generally put them back through Intra venous administration. Intra-Venous Administration of SVF cells enriched with Autologous PRP: Platelet Rich Plasma is mixed with the patient’s own adipose tissue stem cells extract (SVF stem cells) at the time of infusion. The processed cells are infused through Intra Venous Administration for better outcomes. Post treatment, the patient will be asked to visit the doctors for assessment.